German banker, imperial court factor, and diplomat; born at Heidelberg about 1635; died at Vienna May 3, 1703. He enjoyed the especial favor of Emperor Leopold I., to whom he advanced considerable sums of money for the Turkish war. Prince Eugene of Savoy brought him a large number of valuable Hebrew manuscripts from Turkey, which became the nucleus of the famous David Oppenheimer Library, now comprised in the Bodleian Library at Oxford. Although the Jews had been recently expelled from Vienna, the emperor permitted Oppenheimer to settle there, together with his "Gesinde," or his followers, who included a number of Jewish families. He even received the privilege of building a mansion in the heart of Vienna. 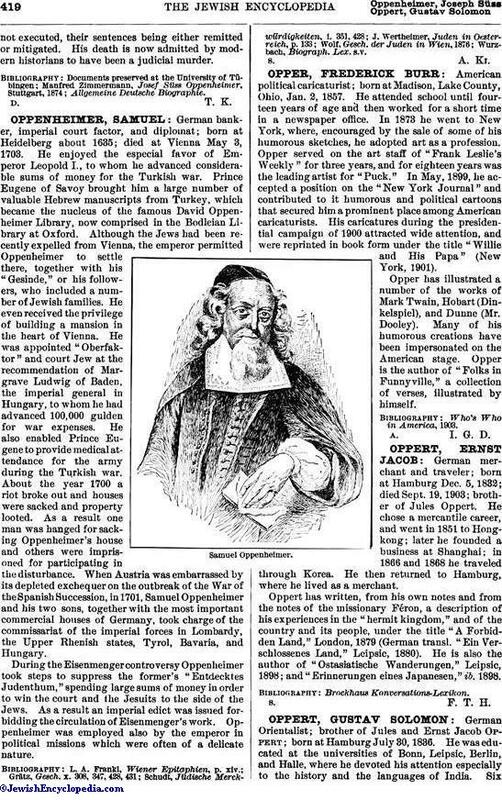 He was appointed "Oberfaktor" and court Jew at the recommendation of Margrave Ludwig of Baden, the imperial general in Hungary, to whom he had advanced 100,000 gulden for war expenses. He also enabled Prince Eugene to provide medical attendance for the army during the Turkish war. About the year 1700 a riot broke out and houses were sacked and property looted. As a result one man was hanged for sacking Oppenheimer's house and others were imprisoned for participating in the disturbance. When Austria was embarrassed by its depleted exchequer on the outbreak of the War of the Spanish Succession, in 1701, Samuel Oppenheimer and his two sons, together with the most important commercial houses of Germany, took charge of the commissariat of the imperial forces in Lombardy, the Upper Rhenish states, Tyrol, Bavaria, and Hungary. During the Eisenmenger controversy Oppenheimer took steps to suppress the former's "Entdecktes Judenthum," spending large sums of money in order to win the court and the Jesuits to the side of the Jews. As a result an imperial edict was issued forbidding the circulation of Eisenmenger's work. Oppenheimer was employed also by the emperor in political missions which were often of a delicate nature.